Zepto Ransomware is a major threat and hit to your system because once it infiltrates your computer, it can encrypt all your important files, including your images, videos, text files, and more. The worst scenario is when you do not have a recent backup copy of these files on an external hard disk because you may easily lose all of them in this nightmarish attack. There is no doubt that this infection is all about money, i.e., your money. After your files get encrypted, you are informed by a changed desktop wallpaper image about the “hostage” situation and that you have to pay a certain amount to get your files back. This could come as quite shocking for a lot of users who may not think twice about paying the fee. But we must warn you that reports show that it is possible that you will not even get the promised decryption key and tool after you transfer the money. If you do not want to lose more than your files, you should consider all possibilities before making up your mind. Since you are here to hear our opinion, we must tell you that we believe that you should remove Zepto Ransomware immediately. But please read our full description to see more clearly about the solutions you may have when hit by this ugly threat. In order for you to be able to protect your computer from similar dangerous infections, you need to know how it is possible that this and other ransomware programs can sneak onto your system without your noticing it. The main method for schemers to distribute ransomware in general is by spam e-mails. This infection has been found to spread as fake invoices disguised as .docm and .zip files. Criminals usually use misleading sender addresses to fool spam filters and unsuspecting users as well. These can be local or state authorities, parcel delivery services (FedEx), hotels, Internet providers, and so on. This is further supported by the subject line to make it even more believable and urgent-looking. Therefore, you may find unpaid invoices, credit card issues to settle an invoice, wrong details on the invoice, and the like. Even if you do not recall any of such invoices relating to you, there is a good chance that you would be curious enough to see what you have not paid supposedly. At least, this is what these cyber crooks count on and users usually fall for it, too. 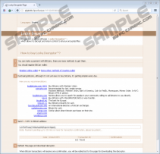 Another method criminals tend to use is called Exploit Kits. There are malicious websites on the web specifically set up for the sole purpose of infecting you with dangerous malware threats by simply loading such a webpage. These take advantage of your outdated browsers and drivers, such as Java and Flash Player. In order to be on the safe side, we advise you to always keep these updated. Our research shows that Zepto Ransomware does not apply this method, but it is still essential for you to know about it to be able to protect your computer more efficiently. Because prevention could be your real savior when it comes to ransomware since even if you delete Zepto Ransomware after noticing its nasty work, you would be too late to save your files. We have discovered that this infection indeed very much resembles a previous beast called Locky Ransomware; but while the latter threat appended a “.locky” extension to all affected files, this malware seems to rename the whole file and adds a “.zepto” extension. Your files will look something like “YYFYSDXF-ENBJ-GSDF-0C80-4C970BE3F009.zepto” where “YYFYSDXFENBJGSDF” is indeed your encryption ID. 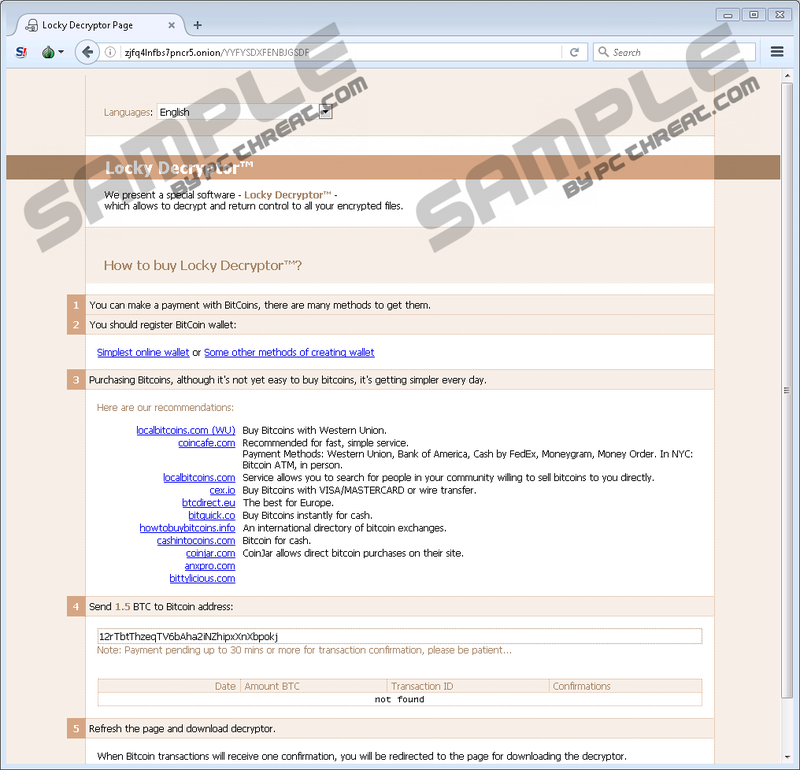 Interestingly enough, the decryption tool of this ransomware is also named "Locky Decryptor" to make the bond between the two infections even deeper and more obvious. This threat uses the AES-128 encryption, which is probably the mostly preferred method. Once the files are encrypted, the encryption key is encrypted with the RSA-2048 algorithm, which makes it practically impossible to decipher it to recover your files. Zepto Ransomware drops two files onto your system: "_HELP_instructions.bmp" onto your desktop and an .html file, "_[count digit]_HELP_instructions.html" in every infected folder. These obviously contain vital information about the attack and how you can restore your files; well, allegedly. Although this ransomware does not lock or block your screen, it does change your background image to its own picture. You are told to download and install the Tor browser and visit a provided address to learn about the payment method and process. You have to pay 1.5 Bitcoins, which is around 856 US dollars, to supposedly receive your private key and the decryption tool. You should know that criminals rarely keep their promise and deliver these. Therefore, we recommend that you remove Zepto Ransomware as soon as possible. If you are up to the task and ready to act, you can easily eliminate Zepto Ransomware from your computer. It is all about deleting the right files. We are here to help you with this, so please use our instructions below if you want to say goodbye to this beast. Also, keep in mind that this will not bring your files back to life. If you do not want to become a “malware-paranoid” or fight endless battles with infections, maybe it is time for you to think about installing a proper security tool, such as an anti-malware program. This tool can give you perfect protection against all kinds of attacks if you keep it updated. But make sure it is a reliable one by researching it first since the web is swarming with rogue programs that will cause more harm than you would expect. Delete the following files: the downloaded malicious file, the ransom note image ("_HELP_instructions.bmp") from the desktop, and the .html file ("_[number]_HELP_instructions.html") from every infected folder. Empty the Recycle Bin and reboot your system. Quick & tested solution for Zepto Ransomware removal.